Pivot Points how to trade. Time frame: 30 min, H1. The pivot points designes areas of support and resistance. The key is to use the behaviour of the price candles at the pivot to determine whether to buy or to sell. Price candle takes off from the brown pivot line, which is a pivot support. Usually, the previous candle would have bounced off this line, so the key to the trade is to allow the bounce to occur, then trade at the open of the next candle.If the candle that performs the bounce closes high up above the pivot support, then it would be wise to allow a slight pullback to the line before initiating the long entry. Usually, price would have been rejected at the pivot resistance line. Once this occurs, you can initiate a short trade at the open of the next candle. A Sell Limit entry is used if the previous candle’s close is several pips below the pivot resistance after that candle has tested the pivot without breaking it. 1) The next pivot line above/below the pivot support/resistance is the nearest TP point. 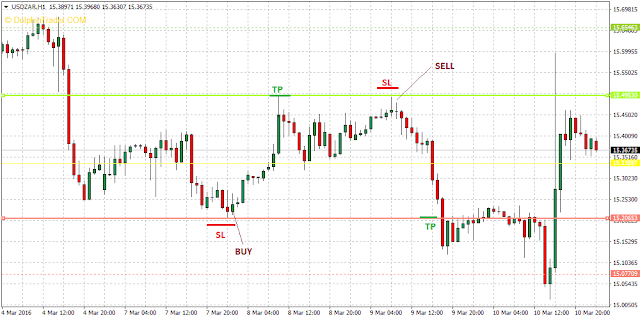 2) Exit position ratio stop loss 1:15. Stop loss 20-25 pips depends by currency pairs. This strategy is not for beginners and requires experience. Where AP is the average price, H is the maximum price, L is the minimum price and C is the closing price. Where PvH1 is the 1st pivot resistance, PvL1 is the 1st pivot support, AP is the average price, L is the minimum price, H is the Maximum Price. Where PvH2 = 2nd pivot resistance, PvL2 = 2nd pivot support, PvH1 = 1st pivot resistance, PvL1 = 1st pivot support.